Crisafulli Vertical Pumps are dependable, powerful, and versatile. They are designed for stationary applications, such as sewage digesters and lift stations, manure tanks, chemical sumps, and dry docks. Each Crisafulli Vertical Pump has a Crisafulli Impeller Inside. Standard Duty Crisafulli vertical pumps are reliable, proven performers. They are equipped with grease lubricated, sealed bearings and are an ideal choice for moving relatively clean water. For sand, silt, mud, sludge or abrasives, choose the rugged Severe Duty version, which are constructed with abrasion-resistant heat treated steel (450 Brinell hardness), have dual mechanical shaft seals (to prevent contamination), and an enclosed oil filled bearing frame, allowing the pump to perform in the most demanding environments. All Crisafulli Vertical Pumps are submersible, centrifugal pumps, which range in size from 2 inches to 24 inches. 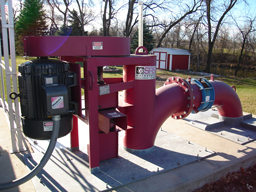 The pumps require no priming, check valves, suction pipes, or screens, and are self drained. Steel construction assures long life and trouble free operation. The pumps pass remarkably large solids and pump high-weight/high viscosity fluids with ease. Flow rates from 32 GPM to 18,000 GPM Horsepower from 1 to 300 HP. No priming required Power sources include direct-drive electric, belt and sheave drive (electric), or gear box driven with gas, diesel or electric motors. Low maintenance Optional open impeller is recommended for manure and sewage uses. Long useful life Stainless steel or special epoxy-coated versions are available for high-acid applications.